The IPTV set-top box market, unlike the one for Android TV boxes, is rather small and does not offer much variety. We are happy to reportthat there is a new box that end users should consider when shopping for their next IPTV entertainment hub: the tvip. There are two important components to a reliable IPTV setup. A high-quality IPTV service provider that streams all the channels and VoD content that you require. And a TV set-top box that connects to your IPTV service and plays the streams. In addition, the TV box also displays your provider’s electronic program guide. There are dozens of options when it comes to TV set-top boxes for different user experiences. Generally speaking, IPTV boxes provide a more cable-like streaming experience with dedicated interfaces for TV streaming. They tend to do better at streaming from IPTV services and overall are a more user-friendly and reliable solution. Android TV boxes, on the other hand, are also capable of streaming from IPTV services using 3rd party apps. However, the user experience is a bit different, not as natural. On the upside, Android TV boxes are very versatile and can be used with a wide range of apps and services. The tvip v.605 falls under the category of dedicated IPTV boxes, supporting IPTV streaming out of the box and with high reliability. On the IPTV service provider side, we have a comprehensive review list that you can refer to. For the purpose of this review, we tested all the functionality of the TV box with Insight IPTV. We’ve been using the tvip for around a month now as our primary, every-day streaming box. In a nutshell, our experience with it has been great. While there are clear arguments for the versatility of Android TV boxes, nothing really beats the streamlined user experience of a dedicated and purpose-built IPTV box. No tweaking or installing additional apps. Simply put in your provider’s details and you are set. tvip is not really a well-known brand, yet. The products are designed in Russia. Luckily, though, you would never be able to tell if you didn’t dig for more information on the company. All documentation, guides, user interface, and their website are in English. So, let’s find out more about this box, what it can (and can’t) do and how it compares vs a MAG, BuzzTV or Dreamlink. Let’s start off with the Specs. Unlike the MAG 254 and 256, the tvip supports 4K HDR video resolution. To ensure smooth streaming at such high resolution, a quad-core S905x 1.5 Ghz processor and Mali-450 graphics card take care of all the processing. 1 Gb of RAM provides snappy navigation and an overall lag-free operation of the box. Under the hood, the tvip actually runs a dual boot with Linux and Android 8.0. This allows the box to support a number of middleware, including the widely popular Stalker middleware, as well as apps. In the box, everything needed to set up the IPTV device is provided. The device itself is rather small and gives a sturdy and high-quality impression. Once plugged in, the device can be started with the supplied remote (which includes programmable buttons for your TV). Booting up the tvip for the first time will launch a short setup wizard to help you get started with the device. Once that is completed, you are greeted with a clean and modern interface. Setting up IPTV providers is quite straightforward but may require a bit of playing around with the various options. This is mainly due to the fact that this device supports so many different middleware and streaming protocols. The great thing about the device is that it can perfectly run one or multiple STB portals just like a MAG set top box would. The user experience of IPTV streaming itself is great. Set up your IPTV portal and have the box boot directly to the portal. From there, you can navigate the channel sections, access the electronic program guide or stream VOD content. Have multiple IPTV providers as backups? No problems with the tvip. The tvip can also act as a DVR and supports timeshift to ensure you don’t miss any of your TV programme’s highlights. Additionally, there are additional apps installed. The list is quite limited currently, with Youtube, Plex standing out as the most useful ones. There is also a media player and the ability to stream from CCTV cameras. 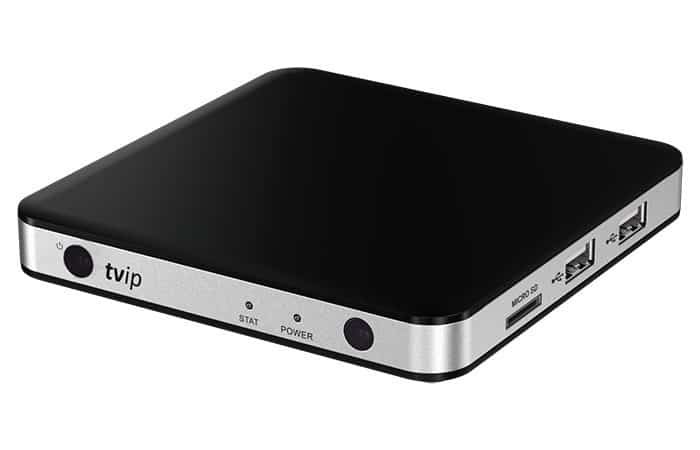 One of the most important questions, of course, is how well and reliable the tvip TV box can stream live TV. And we are happy to report that our experience was great. We did not witness anything that we would or could blame on the tvip. Switching channels, navigating the EPG and streaming TV overall felt smoother and more reliable vs an Android box with Perfect Player. Of course, it also depends on the IPTV service, your router, and many other factors. But from what we experienced, the tvip v.605 handles IPTV streaming like a champ. Apart from the general snappy interface and reliable streaming performance, what stood out to us was the maturity of the device. Initially, we were a bit wary of this Russian streaming box and were not entirely sure how well it would hold up against the bigger names out there. But, we were pleasantly surprised during our one-month trial of the device. We haven’t experienced a single crash, lag spike or stuttering using this box. The interface is clean and easy to use. When we first used the box, an automatic update was installed. Having the latest system software automatically downloaded definitely beats having to check the manufacturer’s website for the latest release. An additional feature we did not use but may be useful to others is the 5 Ghz Wifi. We always recommend using a wired connection. But, if that is not possible, the 5 Ghz Wifi of the tvip v.605 with a powerful Wifi router should give you enough bandwidth for smooth streaming. There is really just one thing that stood out to us that we wished tvip would improve: the limited apps the device currently supports. The box is not as versatile as we hoped it would be. Better compatibility with 3rd party apps would have really helped tvip set itself apart from the other IPTV boxes out there. As it stands, this box is great at IPTV streaming. If you require more versatility, consider an Android TV box. The tvip box is still a bit of a niche product and is not widely available. Mediakoning has it on their online store for around 109 EUR and ships the box worldwide. So, is the tvip a viable contender for the bigger brands on the IPTV hardware market? We believe it is. It certainly hasn’t revolutionized the IPTV set-top box. But, it is very reliable and performed without flaws for us. If support for multiple providers and middleware is important to you, the tvip is the best box to get. If you just want to have a smooth IPTV streaming experience, the tvip is as good as a MAG.